Miss Spell’s Class is a $1 game from Dictionary.com for you’re iPhone or iPod touch. If the deliberate misspelling of “your” in that sentence has you beating a path to Macworld’s forum feature to berate me for my poor spelling, then you probably fall squarely in the app’s target audience. 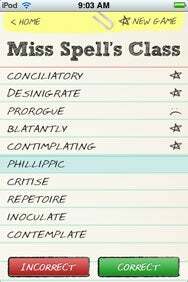 Spell Check: Miss Spell's Class presents you with a list of 20 commonly misspelled words. You’ve got to decide if each item is spelled correctly or not. Miss Spell’s Class is, not surprisingly, focused on spelling. The game presents a list of 20 words, and you must indicate whether each is spelled correctly or not. And even if you’re a spelling aficionado who can spell “aficionado” without a spellchecker, it’s surprisingly tough. The game comes loaded with 10,000 words, and they’re the most commonly misspelled words by searchers on Dictionary.com. Those annoying words that always trip you up? They’re all probably in the game. With the in-game dictionary’s size and the limited number of words per game, Miss Spell’s Class could do a better job with its random selection of words; more than once, I’ve had two different misspellings of the same word on my list of 20. There’s a delightful scholastic feel to the game: The words are presented on white lined paper, stars and frowny faces are the main symbols, and your final score earns you a letter grade. Not to toot my own horn, but I did win my school’s spelling bee in 8th grade… and the best score I’ve gotten so far in Miss Spell’s Class is an A-minus. The game wants you to be both fast and accurate, and it’s seriously challenging to spot-check these words in a hurry. I’d love to see an online, global high scores list so I could compare my performance to my fellow classmates. But even as is, Miss Spell’s Class is a quick fun game with decent replay value, since the motivation to get that A-plus is strong. At this price, it’s easy to recommend—easier than it is to ace, at least. Miss Spell’s Class is compatible with any iPhone or iPod touch running the iPhone 2.2 software update.